One of the all-time great mystery writers was Alfred Walter Stewart, a chemist who hid under the moniker of J. J. Connington. His series detective, Sir Clinton Driffield, was a sarcastic Chief Constable often accompanied by Squire Wendover. They shared plenty of banter along the way, often dripped in irony, as Sir Clinton investigated complicated cases that relied on plenty of ingenuity. Red herrings, twists and double twists are just some of the old friends you will meet in Connington’s ingenious detective stories: and without a doubt, The Castleford Conundrum is one of the very best. In some ways, it’s an archetypal case: an odious woman is shot dead at her estate in the country. There was talk of her will being changed, in which she would have cut off her husband and step-daughter. The new will would have significantly benefited the two brothers of her first husband, and there was also a substantial increase in profit for her half-sister/companion. She had already rescinded the first will, but had not yet managed to pen and sign the second when she was killed. The victim, Mrs. Castleford, apparently met her death as the result of an accident. Her nephew had recently received a rook rifle and was busy firing at everything in sight. The police at first think that this was a tragic accident, as the result of a shot that went wild. 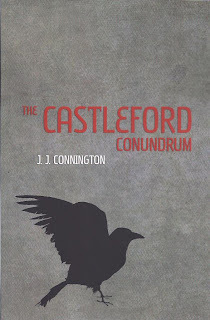 But once they hear of the financial aspects involved in the case, they begin to think twice… Finally, at about the 2/3 mark of the book, Sir Clinton Driffield and Squire Wendover arrive on the scene, and they must resolve the rather complex Castleford conundrum. There are plenty of potential suspects, and with these characters comes the book’s greatest triumph. This is the most universally dislikeable bunch of people you will ever meet in your life. 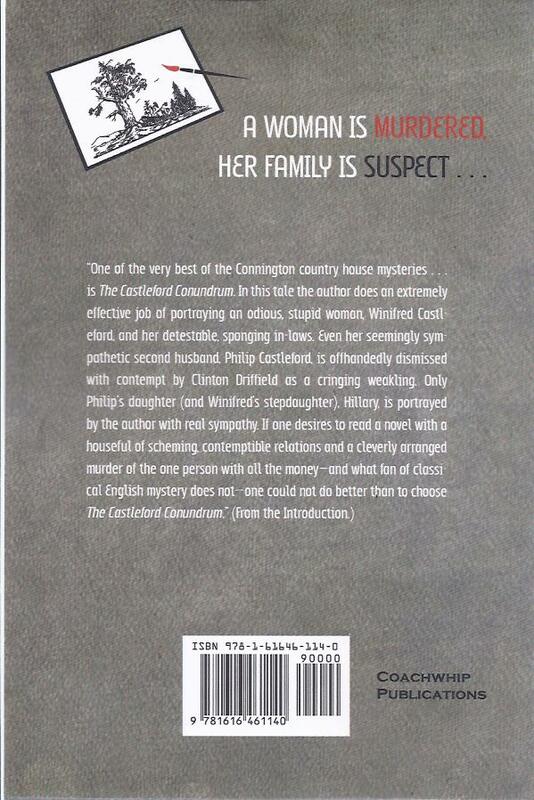 There is one exception: Hillary Castleford, the step-daughter of the murdered woman. She is shown in a truly sympathetic light. Her step-mother hated her and considered her something of a rival. She took every opportunity to make Hillary’s life miserable and never considered the girl’s feelings. She was used and manipulated by everyone except her father. Her father, Philip Castleford, appears sympathetic at first—he is an extremely submissive man, described as the sort who will profusely apologize to somebody if they should happen to tread on his toes. He was under the thumb of his domineering wife, who married him more or less out of pity—she caused him an injury that resulted in the loss of some fingers and thus, cost him his livelihood as a miniature artist. This disability has kept him by his wife’s side, out of hope that she will leave his daughter money so that Hillary can have a decent life. But the second will threatened this last remaining dream. Yet, there are times when you do not feel at all sympathetic to Philip—he has a sadistic streak running in him, fantasizing about all the ways he could murder his wife at one point… yet he lacks the courage to carry any of his plans out, and is such a weak man that it seems like the world will swallow him whole. The rest of the family is a dreadful bunch, though. The young nephew, Frankie, is a brute whose hobbies include torturing cats and shooting at birds. He loves to see pain inflicted on animals, and he is a chronic liar who cannot be trusted. (Of course, he was sure to present an innocent face to his Auntie, and never under any circumstances did anything to offend her.) His father Kenneth remains in the background for much of the novel, but Kenneth’s brother, Laurence, is a doctor who coldly calculated every one of his words to Mrs. Castleford to manipulate her into creating a new will that would favour him and his brother. As for the half-sister/companion, Miss Linfield, she could be bribed to enlist in any particular side, if the price was right—and since she was around Mrs. Castleford 24/7, she got to have much influence over her employer. However, characters are not the only thing worthwhile about this book. I found the plot excellently constructed, with many great clues that I only added up with about 2 pages to go before the murderer was revealed. The killer is well-hidden, and you’re given all the clues to solve it. Motive and method are nicely reasoned out by Sir Clinton, and he provides Wendover with a list of nine vital clues to solve everything. Yet I’m sure that many readers will still be puzzled after these clues are listed. Sir Clinton is a delight when he finally shows up, at around the 2/3 mark of the story. He’s just as ingenious as always, and he has some very good “clever” lines that would have made Archie Goodwin envious! As always, I admire the character of Squire Wendover. In some ways, creating a “Watson” is tougher than creating the “Holmes”. You want to make sure the Watson is not as sharp as the detective, but you don’t want a completely dense and gullible character. Wendover manages to balance things out beautifully—he’s intelligent, but he often requires an extra push that Sir Clinton provides. Well, I'm biased, but I sure I enjoyed this review! I do think this is one if his best titles. 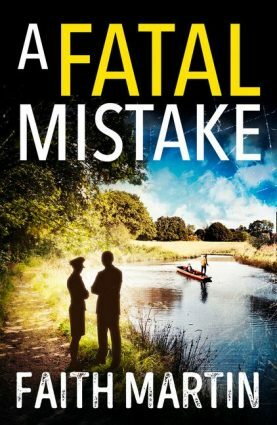 I very much hope that The Ha-Ha Case, The Sweepstake Murders, A Minor Operation, Tragedy at Ravensthorpe and The Case with Nine Solutions can make back into print someday too. Great review. You've certainly made me want to read this one! Martin, thanks for the kind comment-- and I hope you do read this and enjoy it! It's well worthwhile! 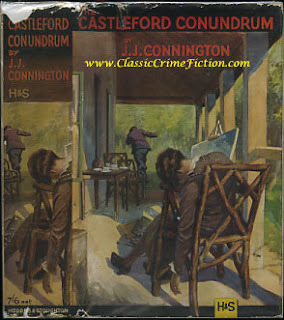 But I would welcome *all* Connington reprints-- and possibly those of Henry Wade? Seriously, THE HA-HA CASE and CONSTABLE, GUARD THYSELF! are so rare that not even the magical Candian Library System has these in the catalogue! Try looking for THE HA-HA CASE under the US title: THE BRANDON CASE. I had one several years ago, but sold it. Once upon a time you could find Connignton's books all over for under $30 each. I the what the internet has done to the used book trade. Everything is "rare" and that means making them way out of the price range of a college student like you. Very wrong, I say. John, what's so frustrating is there is a market via POD books for these authors! But the agencies seem in many cases to rather wait for this phantom big publisher to come along and make them a great offer (which is not going to happen). So everything has to remain in limbo until the copyrights expire. 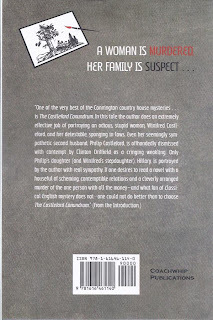 I worked very hard building up a relationship with Connington's daughter (a year younger than P. D. James) and through her was able to work with the administrators of her trust to get them in line with Coachwhip to allow a few Connington titles to be reprinted. Unfortunately, Coachwhip could only get permission to do three titles. It's a trial run. I hope they sell sufficiently for more to be made available.